In this post I will show you how to use JTA transactions with JBoss 6 server, Spring 3 and Hibernate 3. In JEE, JTA allows transactions to be distributed across multiple resources. You don't need a JEE server though to run JTA transactions, Tomcat will do (possibly with a bit more hassle). I decided to use JBoss 6 because it is a popular JEE server - but I would assume you can successfully run the code on any server as long as the data source is set correctly (plus with minor tweaks of server dependent stuff). Look closely, notice the jta-transaction-manager annotation and JtaTransactionManager. This is our persistence.xml. It's a bit different from the non-jta version. Notice the transaction-type attribute. It's JTA as opposed to RESOURCE_LOCAL in the case of non-JTA. You must also specify transaction manager lookup class which is server dependent. You call the transactional operation by accessing http://localhost:8080/springtx-jta-0.0.1-SNAPSHOT/myurl. For reference, the relevant parts of the POM file. How to see the difference between two branches in git? 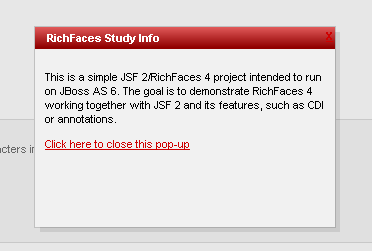 JBoss and RichFaces 4 are not to blame - I am. I realized I switched RichFaces 4 versions (from 4.0.0.Final to 4.0.1-SNAPSHOT) and deployed both with my WAR file. So if you get this error, perhaps that’s what you should look into first.